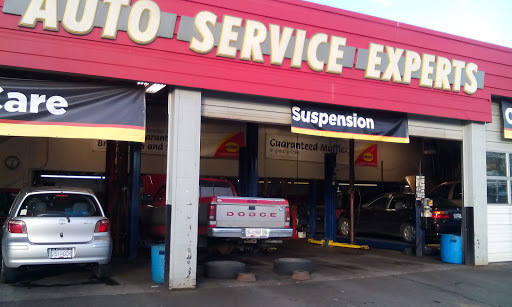 I have a 30 years old Toyota Camry, and I thought I should get an oil change and regular inspection so I came here and wanted to know more about my car, have been here 3 times by the way. First time (Sept 2016), oil change and inspection, they found out that my car had several major problems such as transmission or some other things that costed me over $2000 to get it fixed; second time (Nov 2016), just when I thought that there wouldnt be any problems, my car died at the parking lot, so, I towed it to here and wondered why it happened, they told me that my battery died, it costed me over $900 to get it fixed; the last time (Feb 2017), I wanted to get snow tires because it was still snowing and I knew it wouldnt be stopped until march, they found out that my alignment had a little problem, so again, it costed me another $900. I have spent so much time, energy, and money on this car and I thought there wouldnt be any major problems and guess what, I visited another car repair shop nearby and they told me that theres oil leaking on my front wheel and its happened for years. I also brought the recipes to another place and they told me the repair was definitely overpriced. So here are my questions: Couldnt you see the leaking after I brought my car here to get the snow tires? Secondly, Ive spent over $2000 at the first time and yet my car died 2 months after, I know you cant guarantee that this car would run forever since it still has so many problems, but didnt you see it coming? Whats the inspection doing then if you couldnt see the coming problem? Charging starving student for nothing? You changed everything in my car except for the starter but my car is 30 years old, which makes my car is more thirsty because you changed 4 cylinders to 6? To be honest, I have no ideas how cars work and I trust those technicians because they are experienced. York is a friendly guy (so Ill give 2 stars) but this place is kind of ripping off those who dont know anything about cars. I also lost some coins(approx. $30 after the third time). I know I shouldnt have put money in the car but I guess I just trusted them too much. This car is a gift from my grandpa who passed away last year and I wanted cherish it as much as possible so I wouldnt mind spending thousands to get it fixed, but one thing I cant stand is being an idiot getting ripped off by them. My only advice is dont ever come here if you dont know how cars work. I had a serpentine belt that was asking for attention during the cold weather, and before I went on a road trip to the mountains - it was prudent to get it repaired. I was in the Richmond area and called a couple local places and when York answered the phone he was able to shuffle some of the days work to take my SUV in for an immediate assessment of the situation, called for prices on parts and provided me with a quote - with the willingness to finish the job and get me back in the road by mid afternoon. York brought to my attention a few other items about my vehicle that could use some attention, one of which I added to the work of replacing the belt tensioner & belt ... and the others werent critical - so I will save them for another day. While sitting in the waiting area for a few hours and I witnessed his professional interactions with customers and mechanic staff alike and got a sense that this repair shop had a good reputation for being reliable with the repeat clients, the quotes provided, and the general demeanour of customers paying their bills and driving off happy. I would call on them again, if I need anything else repair or diagnosed. A pleasure to deal with. York, the store manager, is one of the most honest mechanic I have dealt with. My car battery died last Thursday, and I thought I needed a new battery. York was very courteous and professional over the phone, but his price was a bit pricier than what my car dealer has quoted me. Although he could not match my dealers price, he remained very friendly and asked me to call him should I need other services. It turned out my dealer has misled me (this is another story), so I called York again and he said "come down to our shop now and we will take care of you". His shop was quite busy when I arrived, but he was still able to perform not one but TWO battery tests to make sure the results were correct. It turned out that my battery was still ok, and he said he "could not sell me something that I dont need." He did not charge me for the battery tests either. I was extremely impressed with Yorks honesty and level of care. York, you have won me as a lifetime customer. I went there because I thought Midas is a reputable service center. However, it sounds like not as it is. I only want to check the wiper problem, which cost $80 to check. Then after check, they just pushing me to change cabinet air filter and something else, said the filter is too dirty and needs to be changed every year or every 20k. Come on, the filter was replaced only 5 months ago and I only put 5k after replacing it. I just use the car as daily commuting and its vancouver, the 5 months I used the car were mainly rain season. I looked at the cabinet air filter and it is far from dirty. I just payed the wiper checking fee and went out, as they do not show any honesty. They just push people to replace something that is not necessary. I went in to get my car serviced and an oil change. I had the pleasure of speaking to York, Justin and Walker. These men are super helpful, knowledgeable, honest and friendly. I was thoroughly informed of what they will be doing with my car and and how long it will be in case I need to leave it. I asked York a lot of questions and he was very patient to answer them all. Justin, the mechanic went above and beyond to take care of my car needs. I really appreciate him taking the time to explain and show me how to check my tire pressure and describe what work he did for my car My experience at Midas Richmond was very pleasant and I will definitely return for all you car needs. Thank you guys! serviced my acura mdx there. the staff seemed very friendly. the service took about 2 hrs which was quite slow, but the $79 fee didnt seem much in comparison. the manager up sold me a few things, although not mandatory. thats all normal. however, after a few days, my car started to warn me about tire preaure, and soon i realized the tire was slowly going flat. i went to another place to fix the tire, thats when they found out for me that all 4 tires were at 70psi, DOUBLED the required 36psi, all the staff there were amazed i didnt kill myself with these explosive tires, because i sure could have DIED because of them on a highway! recommand all to ABOID this place.